Two of our favorite purveyors of tasty tipple on the north shore have come together in a creative collaboration. 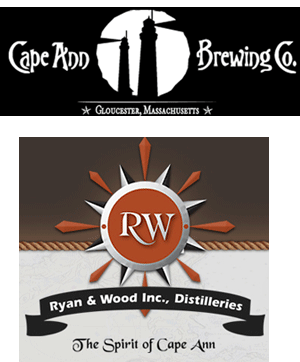 This Friday, April 22nd, Cape Ann Brewing Company along with Ryan & Wood Distillery will be tapping their new project; Whiskey Barrel Aged Fisherman’s Rock-Porter. Oak barrels used by Ryan & Wood to age their rye whiskey for 2 years were re-used by Cape Ann Brewing to age our Fisherman’s Rock-Porter for another 2 months. This event marks the first of many future collaborations between the two companies. Head down to The Pub at Cape Ann Brewing on Friday at 6:00 pm for a chance to taste the new brew and to chat up brewer extraordinaire Dylan Lindquist and the terrific Bob Ryan of Ryan & Wood. We’ve had the opportunity to talk with each of them at length and you’d be hard put to find a couple of guys more passionate about what they do. And be sure to congratulate Bob on his first bottling of rye whiskey!